The legendary Abbey Road Studios…made famous by the Beatles…is perhaps the most celebrated recording studios in music history. Countless fans would love to have been a fly-on-the-wall during the John, Paul, George and Ringo sessions. 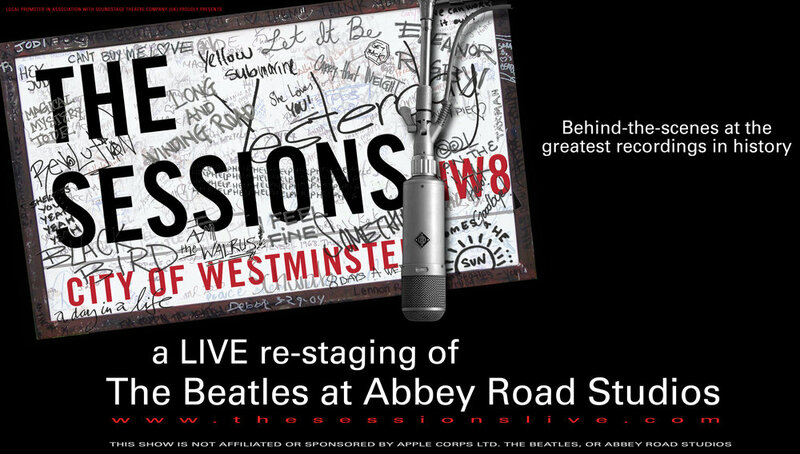 Imagine sitting in on those iconic moments, laying down track after track, with the Fab Four. Now you can come close. We invite you to come back in time as THE SESSIONS recreates those phenomenal arrangements and vocals as they happened all those years ago. Overseen by the acclaimed recording engineer Geoff Emerick, you will experience all the sounds, energy and electricity created by the original live performances. THE SESSIONS was created by Stig Edgren, an international creative producer/designer, directed by Kim Gavin (2012 London Olympics Closing Ceremony), set designs are by Stufish UK with video projections by Luke Halls and world-class lighting by Luc LaFortune. Ladies and Gentlemen - this may have been what it looked like - here are THE BEATLES IN SESSION !